Hey, you're new! I love new people, welcome. You may want to subscribe to Baby-Log via RSS feed or via email. Thanks for visiting! My baby has a flat head and every time I look at him, I blame myself. How could I be so stupid? How could I let this happen? Now, with his hair covering the flat spot on the back of his head it is hardly noticeable, but I know that it is there. Luckily, the shape of his head is improving over time and this little asymmetry is not life threatening, but the fact remains the same – it was an issue I overlooked and it could have been much worse. Experienced moms, you know what I’m talking about – so bear with me, you might learn something new. New moms, let me explain. You all know what SIDS stands for – Sudden Infant Death Syndrom, otherwise known as a cot death or a crib death, means that a perfectly healthy baby unexpectedly dies from an unknown reason. It scares the daylight out of any parent and there is a set of guidelines that was developed to prevent it or significantly reduce that risk. There are great resources online too, here is one – PreventSids.org. I’m not going to repeat all the SIDS guidelines, because there is just one that I’m concerned about, just one that I’ve followed blindly and caused my baby a flat head. Yes, I am talking about always putting baby to sleep on the back. If you ask any experienced child health nurse, any experienced midwife or a pediatrician, they will all agree – babies that are put in bed on their backs very often get a flat head (the medical term is Plagiocephaly). How sleeping on the back causes flat head in babies? Their scalp is very soft and the pressure applied to it when they lay in their backs is enough to cause a flat head by 1 – 2 months of age. 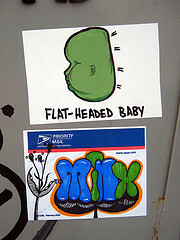 Why should I care if my baby has a flat head? Do I have to choose between SIDS and a flat head syndrome? No way! There is plenty you can do to reduce the risk of SIDS and give your baby a perfectly round head. You only need to be aware and practice it every day for the first 6 to 12 weeks, which are crucial for the form of baby’s head. Hang on, I will get to all the solutions, suggestions and therapies in the next post. Won’t be long! That is why tummy time is so important. Our little ones spend so much time on their backs as they have to sleep that way to prevent SIDS that during awake times we need to remember to use tummy time. Another baby: to have or not to have? Part 2. Another baby: to have or not to have? Part 1. Emma: I will suggest amber teething necklaces. http://www.Baby-Log.com 2008-2016 All rights reserved - I might give you some, if you ask nicely!